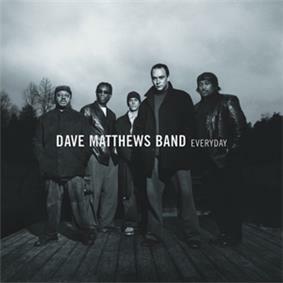 Everyday is the fourth studio album by Dave Matthews Band, released on February 27, 2001. In the United States, Everyday performed very well commercially. It opened at #1 with 755,000 copies sold its first week, and stayed at #1 for two weeks. After 25 weeks of sales, it sold over 2.5 million copies. To date, it has sold nearly 3 million copies. It was the 5th best selling album of the Billboard Year in 2001. The album was also certified platinum in Canada (100,000 units) in July 2001. Initial critical response to Everyday was generally positive. At Metacritic, which assigns a normalized rating out of 100 to reviews from mainstream critics, the album has received an average score of 67, based on 16 reviews. All songs by David J. Matthews and Glen Ballard. As of July 2015, "Dreams of Our Fathers" remains the only song released on a Dave Matthews Band studio album to never be performed live. Carlos Santana — electric guitar on "Mother Father"
Vusi Mahlasela — background vocals on "Everyday"
^ "Gold & Platinum Certification – July 2001". ^ "Everyday - Overview". allmusic.com. Retrieved November 24, 2009. ^ "Dave Matthews Band: Everyday - Music Reviews". ^ "Sound & Vision Magazine – Dave Mathews: Everyday". ^ "Dave Matthews Band: Everyday (2001): Reviews". ^ "Die ganze Musik im Internet: Charts, Neuerscheinungen, Tickets, Genres, Genresuche, Genrelexikon, Künstler-Suche, Musik-Suche, Track-Suche, Ticket-Suche - musicline.de". musicline.de. Retrieved 27 April 2014.